Saataa andaagii was served at last year’s Natsumatsuri. The Japanese American National Museum (JANM), First and Central in Little Tokyo, will present its annual Natsumatsuri Family Festival on Saturday, Aug. 18, from 11 a.m. to 5 p.m. Admission to the summer celebration featuring Japanese and Japanese American performances, crafts, and activities is free. Highlights of the day will include performances by San Fernando Valley Taiko and TaikoProject, a hula performance, three traditional Japanese tea ceremonies, a photo booth, and a scavenger hunt. Craft activities will include origami, sunglass decorating, coloring projects, and JANM’s ever-popular paper hat making. 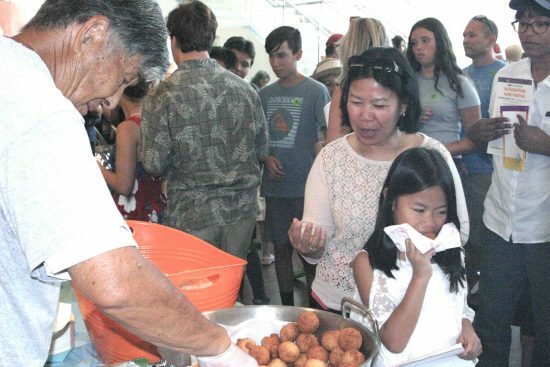 Visitors will also be able to sample saataa andaagii (deep-fried Okinawan pastries), participate in a Bon Odori community dance, and enjoy performances by a capella group The Grateful 4 and the Asia America Youth Symphony Jazz Quartet. Exhibitions on view for Natsumatsuri include “hapa.me – 15 years of the hapa project,” on view through Oct. 28, and JANM’s ongoing core exhibition, “Common Ground: The Heart of Community.” In commemoration of the 30th anniversary of the Civil Liberties Act of 1988, “Common Ground” features a redesigned final section, placing even more emphasis on the accomplishments of the redress movement. This exhibition includes, through Sept. 23, two original pages from the redress bill on loan from the National Archives. Following is the complete schedule for Natsumatsuri. Summer Photo Booth: Grab some fun props from Nerdbot and take a souvenir photo with friends and family. Express Line for members. Summer Shades: Decorate some snazzy sunglasses to show off your style this summer. Paper Hats: A JANM summer tradition. Design your own unique paper hat. Ruthie’s Origami Corner: Learn to fold a paper lantern, a colorful summer festival decoration. Bubble Fun: Make bubbles with Bubblemania and Co. using wands shaped like flowers, butterflies, dinosaurs, dolphins, and more. There will also be bubble hoops that make giant bubbles and bubble racquets and baskets that let bunches of bubbles swirl and float around. Express line for members. Face Painting: Put on your best summer festival face with Party Magic Face. For children only. Line ends at 4:30 p.m. Express line for members. Okinawan Treats: Sample fresh saataa andaagii — deep-fried pastries. Limit one per person, while supplies last. Express line for members. Multicultural Coloring Projects with MASC: Take part in a multicultural art project hosted by Multiracial Americans of Southern California, which creates activities and designs programs to educate, advocate for, and promote social justice for the multicultural, multiracial, and transracially adopted community to increase awareness and understanding around this community. Scavenger Hunt: Take some time to explore JANM’s exhibitions, find all the items on the scavenger hunt list, and win a prize. One per participant, while supplies last. Toddler Room: Check out this cheerful place for parents and toddlers to relax and play. Disney’s “Big Hero 6” — in which a young tech whiz named Hiro saves his city with the help of his inflatable robot Baymax, as well as his friends Go Go Tomago, Wasabi, Honey Lemon, and Fre — will be playing all day. All children must be supervised by an accompanying adult at all times. 11:15 a.m.–12 p.m.: Kick off the day with an entertaining performance by San Fernando Valley Taiko. Join them on stage after their performance for an interactive taiko lesson. Reserved seating for members. 12–12:30 p.m., 1:30–2 p.m., and 2:30–3 p.m.: Join expert Masayo Young as she performs a traditional Japanese tea ceremony. She will prepare and serve green tea (matcha) with traditional sweets. Space is limited; sign up at the information table. Reserved seating for members. 12:30–1:30 p.m.: Learn about Japan’s Obon festival, which honors and celebrates the spirits of ancestors, with Rimban William Briones of Los Angeles Hompa Hongwanji Buddhist Temple. Elaine Fukumoto will then lead a group Bon Odori (traditional dance). Reserved seating for members. 2–2:20 p.m.: Grateful Crane Ensemble is a nonprofit theater company that pays tribute to the unique hardships and inspiring contributions of Japanese Americans. The Grateful 4 debuted in October 2016 as Grateful Crane’s Yonsei a capella group. Reserved seating for members. 2:45–3:15 p.m.: Kaulana Ka Hale Kula O Na Pua O Ka Aina will perform and invite families to dance along with them. Reserved seating for members. 3:40–4 p.m.: Snap your fingers to the music of the Asia America Youth Symphony Jazz Quartet. The AAYS is dedicated to developing and mentoring young musicians by providing educational and performing opportunities in a professional environment and integrating Eastern and Western influences. Reserved seating for members. 4:15–5 p.m.: The award-winning TaikoProject will bring the family festival to a close with a high-energy performance. This year’s Natsumatsuri coincides with the second and last weekend of Nisei Week (Aug. 18-19). Admission is free for everyone on Saturday. On Sunday, adult visitors to JANM who mention Nisei Week will pay only $6 for admission (instead of the regular $12). Sponsors of Natsumatsuri include the Los Angeles County Arts Commission; Department of Cultural Affairs, Los Angeles; and the Nissan Foundation. For more information, visit http://janm.org/natsumatsuri2018.